Over the last day, Russia-backed militants shelled the residential areas of Avdiivka, a frontline town in Donetsk region. “Mortar rounds hit a residential house and a shed on Lermontova street. 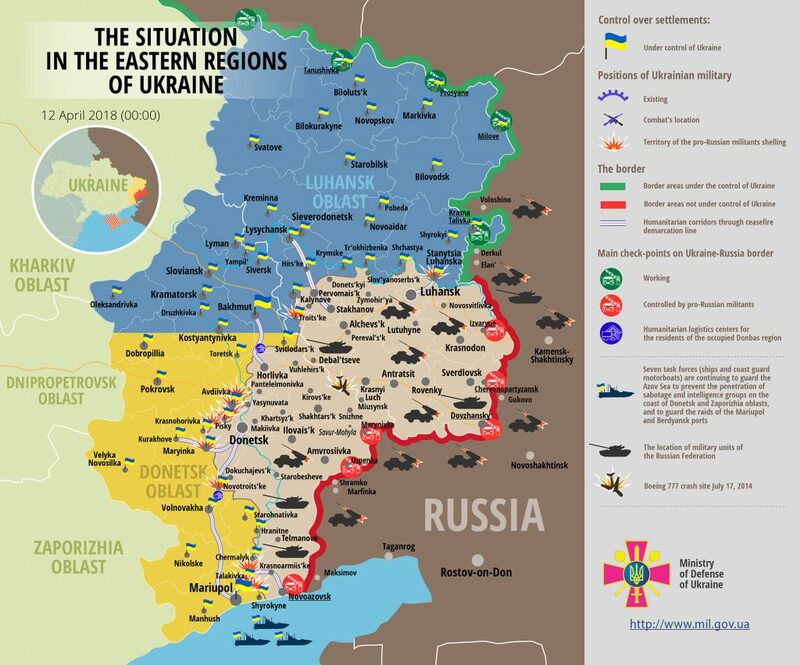 Luckily, there were no civilian casualties,” reported Ministry of Defense spokesman Colonel Dmytro Hutsulyak at a press briefing at Ukraine Crisis Media Center. In Luhansk sector, Russian proxies used 120-mm mortars in Troitske area. Moreover, at about 20:35 militants attacked Ukrainian positions near Stanytsia Luhanska with small arms. “By their attack Russia-backed militants once again disrupted the disengagement of forces and weapons in Stanytsia Luhanska area scheduled for April 13,” Colonel Hutsulyak said. In Donetsk sector, Russia-backed militants made 36 attacks, mostly near Avdiivka and Vodiane. Militants fired forty-three 120-mm mortar rounds near Pisky and Shakhta Butovka. Outside Kamianka militants were attacking the Ukrainian positions with a tank cannon for an hour having made a total of 16 shots. Russia-backed militants used 82-mm mortars in Pisky area twice, they also made one attack in Novotroitske area and one outside Shakhta Butovka firing a total of 20 rounds. “Ukrainian strongholds near Avdiivka, Vodiane, Hnutove, Kamianka, Lebedynske, Nevelske, Novotroitske, Opytne, Pavlopil, Pisky, Pishchevyk, Pervomaiske, Talakivka, Shyrokyne and Shakhta Butovka came under fire of hostile small arms, heavy machine guns, and grenade launchers,” the Ministry of Defense spokesperson added. Fortunately, Ukrainian troops incurred no casualties yesterday. Report on the military developments as of April 11 is available here. Interactive data on the shelling: chronology shelling chart and the interactive map.